For more than 60 years, the snow sports school of Zug has left the foggy town of Zug for a beautiful day in the snow on five Sundays in December and January. Each day starts at the train station of Zug, where we meet up and then drive to the ski resorts. 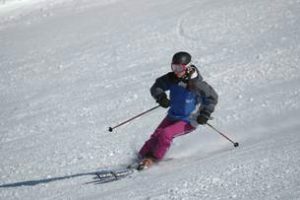 Our instructors do not only guide the participants on the slope, but also throughout the whole day. With the snow sports school of Zug fun and education go hand in hand. It doesn’t matter if you are a total freestyle freak and would just love to spend the whole day in the park, or if you’ve never stood on a board or a pair of skis before! Our team of young and motivated instructors offer courses at all levels. •7.45 Uhr Departure of the coach to the ski resort. During the journey we sell the ski tickets (day pass) and control the participant cards. The day pass has to be bought for every day seperatly. •12.00 – 13.00 Uhr Lunch at the restaurant. The majority of the group will eat lunch in a self service restaurant. If you want to supply your child with your own food you can do this. A separate, heated location is available. •16.30 Uhr Departure back to Zug. For information about the ski level please klicke here. For information about the snowboard level please klick here. 1) In case of an accident, the participant is responsible for his own insurance. We decline any liability. 2) In case of an accident, the cost of the course is not refundable. 3) The participant has to follow the directions of the instructor. 4) The participant’s equipment needs to be in perfect condition. We recommend to have it checked out by a professional before showing up for the course. 5) If the participant can not make the course for any reason, the cost of the course is not refundable. 6) In case of a cancelation because of bad weather or lack of snow, the replacement date will be taking place instead. 7) The participant must be a minimum of six years old and needs to be independent and able to nourish himself/ herself. The participant must wear a helmet. If participant chooses to go to the snowpark, an additional back protector is required. 9) The participant agrees that any pictures or videos taken belong to the Schneesportschule Zug and can be used for promotional purposes. For Information about our teaching levels and condition of participation please klick here.